Rosalyn is a high performing consultant in professional services. She is known for her bubbly personality and easy manner. But she is also highly competent and ambitious. She has just been asked to help the Head of Tax at a major client with a complex issue. After their first meeting the client called Rosalyn’s boss and asked if she was up to the job, “She’s much too nice…”was one of his reasons for the call. On closer acquaintance he revised his opinion but not without Rosalyn having to work very hard to demonstrate her competence and down play her personality. What happened to Rosalyn can happen to any of us. Our brain is geared to make judgements when we first meet people and these judgements inform how we interact with them.They can change but it takes effort. Humans tend to think only as much as they need to. These first unconscious assessment will be linked to safely. 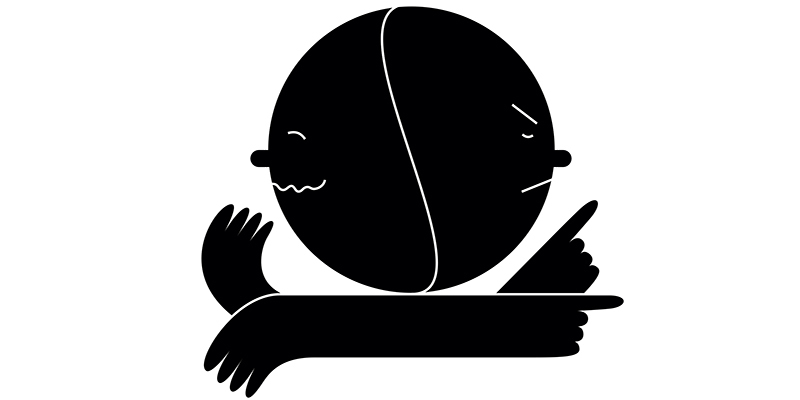 “Is this person a friend or foe?” This tendency to think quickly and based on stereotypical data has coined the metaphor of the cognitive miser. That is, we don’t tax our brain unless there is significant upside. And making judgements of others isn’t in the category of where we use a lot of cognitive resources most of the time. What this means is we make fast judgements and then rarely make the mental effort to change them. In the story above the initial judgement of Rosalyn was only modified because her boss persuaded the Head of Tax to get to know her better and she went all out to show the other side of her character – her competence. Whilst making fast judgments based on safety was clearly a useful approach in evolution it can make business tricky. Our brain is geared to make judgements when we first meet people and these judgements inform how we interact with them. First impressions rely on speed over accuracy and it’s a trade off the brain uses to preserve energy. There are too many competing demands on our cognitive processes to give our full attention to others, and for that matter to our own behaviours. Hence, we rely on behavioural habits that serve us most of the time. We use the same approach with people without thinking about what will create the right impression. For example, Rosalyn might of thought about her first meeting with the Head of Tax and worked out he was in dire straits, was likely to be stressed about it and would therefore be overly concerned about her ability to solve his issue. He probably wasn’t too concerned if she was likable as his assumption was he would only be working with her once. Now the Head of Tax was probably not thinking all of this through rationally or even consciously. He would have been using what Danial Kahneman calls System 1 thinking – the tendency to make judgements fast and based on very limited data. Likewise, Rosalyn was also using System 1 by approaching the meeting as her ‘usual’ self, the habitual way she gets to know new people, emphasizing her warm personality. Our tendency is to move on before we have engaged System 2 to check the validity of our initial judgements of others nor do we step back before meeting new people and wonder what version of us – the warm friendly version or the competent version – will work best. System 1 is of course useful in many situations and allows us to process huge amounts of information quickly and to take action to stay safe. But it is also the bases of bias and mistaken judgements. Studies by Susan Fiske and Amy Cuddy have shown that we judge people primarily by two criteria: their warmth, and their competence. These are often described as trust and power. And in a business context these descriptions may be more useful. The first and most important question we ask ourselves, unconsciously, when we meet someone is: “Do I like this person?” which is an assessment of their warmth and trustworthiness, a reading of whether we feel they are a friend or foe, in which case we need to be weary of their intentions. That judgement is followed by “Do I respect this person?” which is a judgement of their effectiveness and competence, and how capable they are of carrying out their intentions. We are constantly assessing people on the scale of warmth vs competence, based on their non-verbal signals. At the same time we are also unintentionally sending a continuous stream of non-verbal signals of our own that other people use to judge how warm or competent weare. These two dimensions account for about 80% of our overall evaluations of people and shape our behaviour toward them and how we feel about them. This judgement of warmth and competence determines why we hire someone, why we engage easily with one client but not another, even why we may win or lose a piece of business. High competence but low warmth creates envy. This is the highly technical IT guy who is essential to the project but not someone you invite for an after-work drink. High warmth but low competence results in pity. This is typically thought of as the working mother or older person struggling to understand a changed workplace. 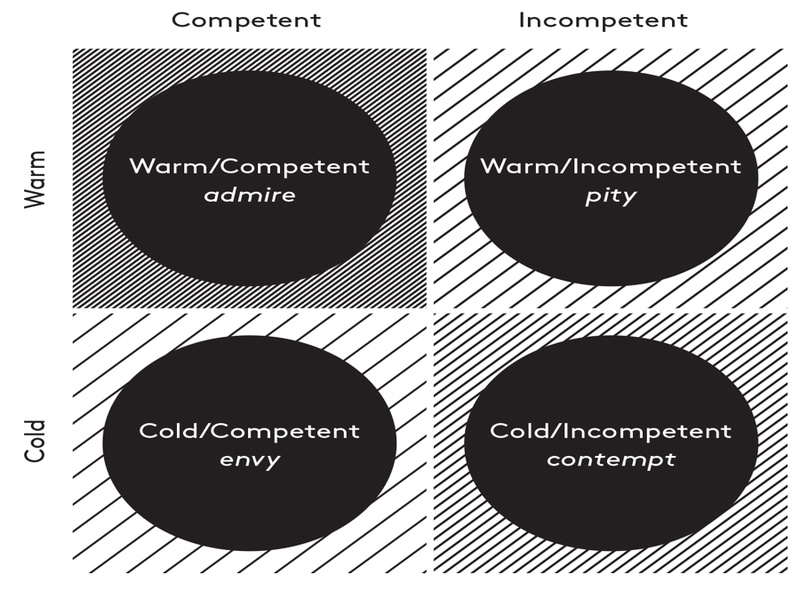 Low warmth and low competence generates feelings of contempt. These people aren’t typically employed, indeed the unemployed are often categorised in this way. How others see us determines their attitude towards us. So we tend to envy cold competent people – they are useful on a key project but we don’t want to hang out with them whereas we like warm people but tend to think they are not very competent. When people are asked how theywant to be judged, they tend to value competence over warmth. We want other people to be warm and trustworthy, but we want ourselvesto be seen as competent and powerful. We would rather have people respect us than like us. Amy Cuddy, says this is probably a mistake when we consider the importance of social connection to humans. Many leaders demonstrate competence but give much less consideration to how much warmth they exhibit. Yet warmth is equated with trust, and we need to connect with people and build trust before we can influence them. Trust is the conduit for influence; it’s the medium through which ideas travel. If people don’t trust you, they are not going to be open to your ideas. This explains why leaders who use a command and control style may be feared but not trusted, respected but not liked. There’s an interesting asymmetry in the assumptions people make about warmth and competence. Many factors can indicate competence: scoring well on an exam, answering a tricky question from a client, getting a good degree, for example. Cuddy’s studies have shown that if you demonstrate competence in one area, it’s commonly assumed that you are competent in other, often unrelated areas. This is one reason why technical managers are so commonly appointed to leadership roles: they have demonstrated their mastery of complex issues that are essential to the success of the organisation. They’re good: it’s assumed they’ll be good at people-management as well. There’s a sort of “stickiness” to competence: once the label is applied it’s not quickly taken away. (Which may be why so many poor people managers are being left to struggle.) A single incompetent behaviour – failing one exam, one set of poor engagement scores from the team – is not generalised: it will simply be dismissed as a one-off or an unlearned skill. We seem to assume that overall competence can’t be faked. By contrast, warmth (sincerity, trustworthiness…) is judged differently. And maybe from an evolutionary point of view this was because it was so important to survival: misjudging warmth and trustworthiness could result in death. A single example of openness, generosity or compassion (staying late to help a colleague with a big presentation, taking a junior under your wing) will not lead to a generalised assessment that this is a warm, generous, open person. The unconscious assumption is they might just be doing this because it looks like the right thing to do. But a single instance of being cold or unkind (speaking harshly to a member of the secretarial staff, for instance) means they are categorised as an insensitive, heartless person. The assumption seems to be that it’s possible to fake warmth or kindness, and a moment of meanness reveals true character. Show people you trust them, research shows people who are shown trust get not only a boost of oxytocin but also tend to behave in a more trustworthy way. Trust generates more trustworthy behaviour. One issue is these are all ‘soft’ skills. But warmth can also be conveyed by ethical behaviour too, like fairness and honesty. At work you want to be seen as competent, it’s the way you get key assignments, new clients and promotions. Obvious ways are to highlight your experience and qualifications but that’s not always possible without being seen to boast. Making eye contact is important, research shows that people who make eye contact are judged as more intelligent. As is being easy to understand, having a fast rate of speech, gesturing, nodding and being relatively contained in your body language. Any authoritative behaviour like challenging (as long as you can back it up) speaking confidently, taking up space, all link competence with stereotypical masculine traits of leadership. Appearing to have willpower is also an indicator, having poor behavioural habits like over eating, drinking or smoking are all judged as less competent. But beware of over competence. Research at University College London found over competent people are not liked or trusted. The research indicated if you add some modesty to your achievements, “It was as much the team as me” it adds 20 to 30% to your rating of competence. Studies show that people tend to see warmth and competence as inversely related: if someone is seen to be capable, efficient and effective, they’re assumed to be less warm and less people-oriented. The more competent someone, is seen to be, the more it will be assumed they are hard-boiled. The entrenched assumption is if you are really competent you wouldn’t need to be so warm and nice: highly competent people don’t have to be liked. In fact, warmth may even be judged as weakness. These judgements are made of both men and women, but in the workplace – and especially in considering people in leadership positions– the judgements come with associations linked to masculine and feminine stereotypes. Masculine leaders are competent and powerful but not warm, feminine leaders are warm but not powerful nor usually seen as competent. Because stereotypically men are more likely to be known for their technical competence than their people skills, and a positive rating for competence and effectiveness is harder to lose, they’re effectively given a free pass on their lack of people skills: it’s just not expected of them. Their authority and competence is pretty much inviolable. Whereas women are more often promoted for their “warm” people skills, and one miss-step, one incident viewed from an unfavourable angle, can damage their reputation irreparably. So, a man who didn’t anticipate all the technical problems that could arise during a project – that’s understandable. But a woman who didn’t manage to placate an unhappy client – that’s a sign that she doesn’t have the right personality for the job. Research by Catalyst, the pressure group on equality, found that women leaders were judged as competent orliked, but rarely both. Their research showed that when women behave in ways that are traditionally valued for leaders (assertive, authoritative, analytical) they tend to be seen as competent, but they are also seen as less influential, less personable and less effective with people. And they are liked less. And hence less likely to be trusted. But men gainfrom becoming fathers. They’re now seen as being as warmer, but no less competent. People who are judged to be more competent get hired and promoted and sent on training courses (even if they’re not liked that much). What working mothers gain in perceived warmth they lose on just about every important workplace metric. Employers are less interested in hiring, promoting or training working mothers compared with working fathers or employees without children. This is why it’s so hard to convey both (along with our reliance on stereotypes and being cognitive misers). Qualities of warmth that are not also indicators of low competence are related to moral behaviour. Research by Paul Rozen shows these behaviours are also indicators of trust: fairness, courage, taking responsivity, honesty and loyalty – they convey good intensions even better than the behaviours traditionally associated with warmth. Walking the tightrope, says Amy Cuddy, may not mean surrendering to the stereotype. People, especially leaders, tend to over-emphasisethe importance of projecting high competence. Many want to be the smartest person in the room. Clearly there are advantages to being seen as highly competent – the research shows you will in turn feel more powerful and more willing to take risks. But it’s rarely a good idea to be like that all the time.It alienates people, makes them defensive about their own status and thus less receptive to influence and new ideas. And if you’re preoccupied with appearing competent and powerful there isn’t the mental capacity to also be creative, and to read other people and what they need. Pick and choose your moments of shining brilliance is Cuddy’s recommendation. Your goal should be to connect with people first and only impress them with your abilities occasionally. They are much more likely to listen to and believe your ideas if they already like and trust you.